When is your Passover party? Wait. You haven’t planned it yet… ??? 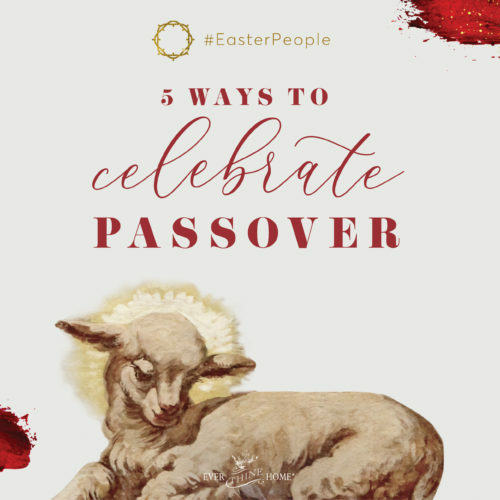 You might think that celebrating Passover is only appropriate in the Jewish tradition, but this holiday is the foundation upon which Easter stands. They are inextricably tied together. Passover is the first feast God commanded His children to celebrate. This meal both celebrates and commemorates God’s liberating of Israel from Egypt. What that means to those of us who grew up singing kids’ church songs is it’s the day “Pharaoh Pharaoh, oh baby, let [God’s] people go. *umph! * Yeah. Yeah. Yeah. Yeah.” Anyone else remember? Now I can’t get the song out of my head! Overburdened with work and mistreatment, the Israelites were enslaved for 400 years. Serving and suffering they cried out every day for God to save them and deliver them. If you’ve watched the old movie The Ten Commandments, you get a sense for the pain our faith ancestors experienced. Watching this movie is a great tradition to repeat every year before Easter. If you know the story, God answered the Israelites’ plea for deliverance in His perfect timing. He called Moses and told him to return to Egypt and request freedom for God’s people. But Pharaoh denied Moses’ plea, so God sent ten plagues to punish Pharaoh and to prove His power. Each succeedingly worse plague could have been avoided if Pharoah had released the Israelite slaves. But he refused. During the tenth plague, God killed all the firstborns—humans and animals—living in the land of Egypt. That would have also included the Israelite slaves too, God’s own people. But, as God always does, He provided a way out for anyone who would follow His specific instructions. God instructed Moses to tell His people to sacrifice a perfect male lamb. First, they were to paint their doorposts with the lamb’s blood as a sign to the angel of death who when he saw the blood would pass over that house; hence the name Passover. Secondly, the family prepared a meal of the lamb, unleavened bread (flat bread without yeast) and bitter herbs. As God said He would do, the Angel of Death came at midnight (Exodus 11:4, 1:29) and took the life of every first-born grandparent, parent, sibling, even babies. Firstborn cattle and goats weren’t spared. Shrieks and cries of family members rose across the land as they discovered the dead. God’s people listened, waited, and prayed. As morning neared God’s promise proved true; only those with the bloodstained doorpost were spared. God indeed passed over those who believed in Him for salvation and deliverance. 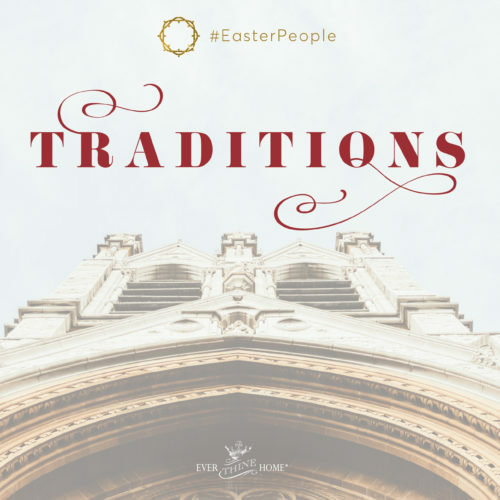 While this age-old story may feel a bit irrelevant today, understanding the deeper meaning in the layers of this story makes our Easter celebrations rich and full of wonder at God’s power and love. This is likely an entirely new idea to you. I’ll admit we didn’t do this with our kids growing up, but I would have tried had I known the story and value of Passover. I wish I’d had these ideas for how to accomplish a meaningful dinner, even if accompanied by eye rolls, which surely would have happened, right kids? 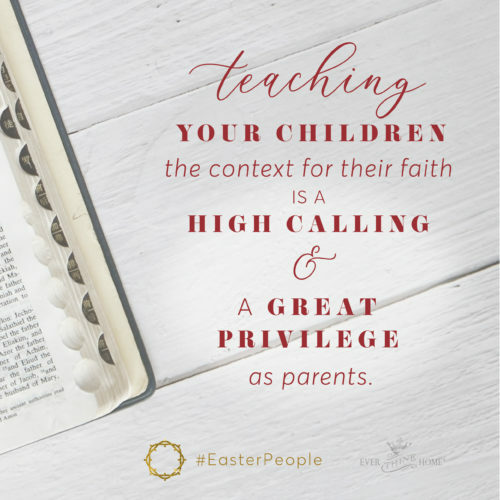 Teaching your children the context for their faith; the mysterious paradox of being cleansed from sin by blood, the value of repeated traditions that tie us together as a family and as believers, and sharing the wonder of God’s very present working today is a high calling and a great privilege as parents. So here are 5 ideas for pulling off a night of remembrance, including a Passover meal if you desire. Choose what works best for your family. Steps to prepare your family and gather what is needed. 1) Prepare your family on the weekend before Passover by watching the Ten Commandments, the original movie with Charlton Heston as Moses. Everyone will have a better feeling for the story and the miracles of God’s deliverance if you watch as a family. Pop popcorn and make it a fun event for everyone. And encourage questions and conversation when the movie ends. 3) Buy washable red paint, Crayola brand red finger paint works, to paint the doorposts and lintel (the two sides and top of your door frame) on Passover evening. Passover is Good Friday and Saturday, April 19 and 20, this year. Make this a family activity as you read the story of the first Passover in Exodus 11: 1-10 and 12:29-36. Or paint your doorposts as part of eating a Passover meal, explained below. 4) Act out the first Passover with your children. Everyone can wear bathrobes or tunics, shawls and sandals to pretend to be the Israelites. If you want to include food purchase: grape juice or red wine; pita bread for the unleavened bread, or a box of Jewish Matzah bread which is more like crackers; hard boiled eggs; charoset which is a sweet chopped apple relish; a piece of parsley for each person; lamb or chicken for the meat. Or go to the Jewish temple in your town and join them in their Passover meal. If you can pull off even three of these four simple activities above, you will be making a big impression on your children. You will be teaching them year after year the importance of God’s plan for our redemption and the importance of remembering Jesus’ sacrifice for us as He commanded us to do. God showed us the way of salvation through Moses and the Israelites. He then accomplished it once for all in Jesus on the cross. If you want to go all in, here are simple instructions for celebrating Passover with a meal, also called a Seder, like the Jewish people have done for centuries. Invite some friends from church to share the work and the experience. Remember Jesus was Jewish and His last supper was the Passover meal. Read the story of the first Passover in Exodus 12:3,5-7 & 13. Then as a family go outside the front door of your house and mark your door posts w the red paint or the piece of red fabric you purchased. Say a simple prayer of thankfulness that God passed over you by the blood of Jesus. Then go back inside to your dining room or kitchen table. The Mother of the family lights candles on the table to symbolize that the Light of the World came through a woman, Mary. Everyone takes a sip of the grape juice or wine and Father gives thanks for this drink, the cup of sanctification. Then Father washes his hands and passes around a small dish of salted water into which everyone dips their piece of parsley. Take a small bite to remember the tears of suffering God’s people experienced in Egypt. The Father then takes 3 matzo breads and wraps them together in a cloth napkin. He then removes the middle loaf or piece and breaks it in half, replaces one half and hides the other under a small pillow nearby or in another room. When your meal is finished have someone read Psalm 113 and 114, which the Jewish people sing and is called the Hallel. After the reading or singing, everyone takes a drink of the grape juice or wine again. This is the second cup, called the cup of plagues. Father then pours more wine or grape juice into glasses and says this is the cup of redemption. After the third cup the second part of the Hallel is sung or read, Psalms 115-118. In Jewish tradition, children search for the missing piece of bread and the one who finds it is given a few coins as a prize. You can add this to your Seder dinner if you wish. It is a picture of the body of Jesus broken for us and hidden in the grave for 3 days. You can end your meal with the search or let your children hunt for the hidden bread earlier in the meal. Knowing all this history and tradition is good for our faith for it prepares us to better appreciate all that awaits us at the marriage supper of the Lamb! Get to know God in these rich meaningful traditions! Thank you!! I have been looking for ways to make Easter about Jesus (because that’s what it is about) and I love that these are easy ways that we can do it and the kids will love it too!! Thank you!! Thank you SO MUCH Barbara for sharing this!! :-) We are not Jewish have been celebrating Passover for around 16 years now, as we see Jesus woven in and throughout the Passover in countless detail, it is truly amazing!! Passover as all of the Feasts and Festivals are His, and they show all showcase Jesus in many facets like a beautiful diamond. We also really love the Feast of Tabernacles, truly a JOY!!! :-0 I appreciate you explaining this and sending it out! That’s so awesome! Thanks for sharing and reading the blog. 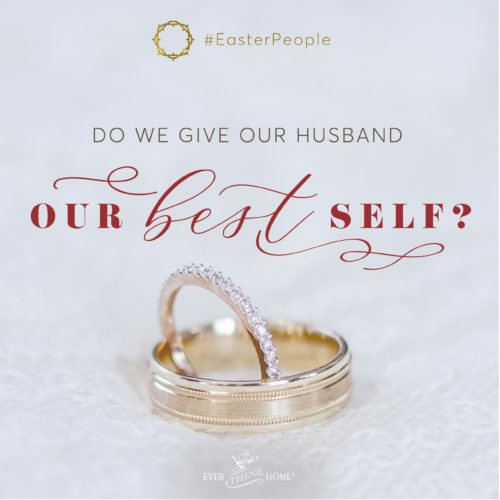 ← Do We Give Our Husband Our Best Self?